Becoming a CNA can be the start of a great career in the healthcare field. To build a good foundation for your career, you need to find the best CNA classes. Finding a CNA class in Minnesota requires you to understand the local CNA training requirements and locate an approved provider. To help you get started, Test-Guide.com has compiled a list of all approved CNA classroom providers in Minnesota. You can request information from some of them by filling out the request forms here on the site. We've also provided information on how to become a CNA in Minnesota, how to pass the exam, and the local job market. There are five general steps to follow to become a CNA in Minnesota. You need to understand the training requirements, find an approved classroom provider, pass the CNA exam, get listed on the Minnesota CNA registry, and find a job. Find more information on each of these five steps below. To work as a CNA in Minnesota you must complete an approved training program, pass a CNA competency exam, and get placed on the Minnesota CNA registry. Each CNA training program will have its own admissions requirements, but many programs may not require you to have a high school diploma or GED certificate. Some schools may require you to take an admissions exam to measure your basic academic skills in math, writing and reading. The Federal Government requires that any Medicare or Medicaid nursing homes utilize nursing aides that have met training and assessment requirements that are approved by their state. The training requirements for CNAs in Minnesota are specified by the Minnesota Department of Public Health. The Federal regulations for nurse aide training programs require a minimum of 75 training hours, including at least 16 hours of practical or clinical training in a supervised environment. States must meet or exceed these training guidelines. Currently, 32 states require training that exceed the Federal minimum training hours. The federal regulations require that the CNA classes cover specific topics. At least 16 hours of the training must be supervised practical training in a laboratory/clinical setting. This 16 hours of training should cover the following areas: communication/interpersonal skills; promoting residents' independence; infection control; respecting residents' rights; and safety/emergency procedures. Minnesota allows three different curriculums that meet/exceed the federal regulations. Minnesota State Colleges and Universities - This is a 75 hour (or longer) curriculum which has a minimum of 16 hours in licensed nursing home clinical setting. Red Cross - This program must be at least 75 hours long and include at least 16 clinical hours in a licensed nursing home. Classes using the Health Care Core Curriculum/Skills Set (HCC Plus Skills) - This is a 128 hour training course which includes at least 24 hours in a clinical setting at a licensed nursing home. 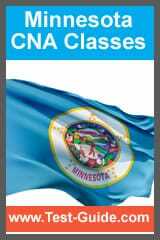 View the complete list of Minnesota Approved CNA Classes here. To become a CNA in Minnesota, you must pass a CNA exam. The Minnesota Department of Health (MDH) specifies the exam content, passing scores, and candidate eligibility. Minnesota has partnered with Pearson Vue (a national testing provider) to use the National Nurse Aide Assessment Program (NNAAP) to certify nurse aides. The NNAAP Exam for Minnesota consists of two sections: a written exam and a skills examination. The CNA Exam is intended to assess a candidate's knowledge, skills and abilities related to the nurse aide job responsibilities. The written exam contains 70 multiple-choice questions. Test-Guide.com's CNA Practice Test will show you what the questions look like. The CNA Skills test will require you to perform five randomly selected skills in a 30 minute time period. You must successfully pass all 5 of the skills in order to pass the skills test. The current examination fees for the Minnesota NNAAP Written Examination and Skills Evaluation are $64. You can find more information by viewing the Minnesota Nursing Assistant Candidate Handbook (PDF). Before you can work as a CNA in Minnesota, you must get on the Nursing Assistant Registry. A facility is required to contact the Minnesota registry to verify that a CNA has met their competency evaluation requirements and maintained their employment status. To get on the nursing registry in Minnesota, you must have: completed an approved training program, passed the Minnesota CNA exam. If you are a CNA from another state, you may get placed on the Minnesota registry by: being in good standing on another state's registry, and have worked at least 8 hours as a nursing assistant in the other state in the past two years. The Minnesota Nursing Registry is not an online registry...you must call 651-215-8705 (or1-800-397-6124) to check the registry. All you will need is the CNA's social security number. If you are not on the registry, but you feel you should be, stay on hold to reach the registry staff. CNAs (Nursing Assistants) help provide basic care for hospital patients or residents of nursing homes or long-term care facilities. Because of the aging population there are always job openings for CNAs. In general, the employment out look for CNAs is very positive, with an expected growth of 21 percent. In Minnesota, there are expected to be 850 CNA job openings per year (over the next 10 years) which is a 9% growth rate. The median salary for CNAs in Minnesota is $12.98 per hour, which is equivalent to $27,000 per year. The median CNA salary across the United States is $12.07 per hour or $25,100 per year. Many people choose a CNA job because they want to get in the fast growing healthcare field. CNAs often look to grow their careers by continuing their education and becoming a LPN (licensed practical nurse) or RN (registered nurse). NAR/CNA Earn Up To $21/hour PM Shifts Needed !